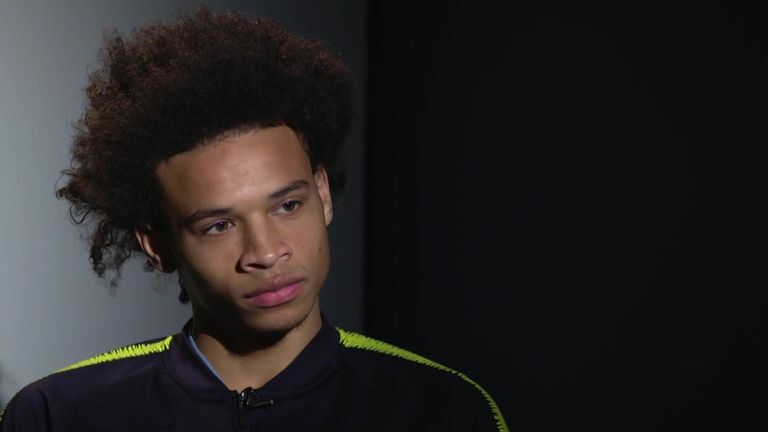 Leroy Sane says Manchester City's defeat to Chelsea has served as a wake-up call for the Premier League champions. Pep Guardiola's side had started the season with a bang, dropping only four points in their opening 15 games prior to defeat at Stamford Bridge. Chelsea were the final side from last year's top six they had yet to face - having emerged unscathed from Anfield, Wembley and the Emirates unbeaten, and beaten Manchester United at home. Despite dominating the hosts in west London, City were undone when Chelsea exposed two lapses in concentration to inflict their first league loss since they were beaten by Manchester United on April 7, and will look to bounce back when Everton visit the Etihad on Saturday, live on Sky Sports Premier League from 11.30am. "It is always kind of annoying and it hurts, to lose especially a big game," Sane told Sky Sports. "We were really disappointed because even at the beginning the game looked in control and we had quite a few chances. "I think everyone could see again that at a high level it is really difficult and hard to play. I think this game was a little bit of a wake-up call, but we are still really hungry, everything is still really tight, and still kind of early. "I think sometimes we make some simple mistakes in our game, like simple passes when we are not really awake, or 100 per cent focused on the beginning, we can lose and miss goals. "Those kind of things can sometimes create some difficult times, create chances for other teams and they get confident. We have to be more focused on our game, to use our chances also at the front, to create more hunger. I think we improved already a lot this season again." Sane has forced his way back into Guardiola's team after missing out on Germany's World Cup squad in the summer, receiving some criticism from his club manager during pre-season and watching some of City's games at the start of the season from the bench. But now the 22-year-old is looking to the future and determined to use an up-and-down 2018 as motivation. He said: "[The World Cup] motivated me much more to say I have to be at the next big tournament. It's a dream for me, and when I saw friends and team-mates playing, I was quite a bit jealous of them, of course, and happy for them too. "For me, I don't care anymore and don't even think about it anymore, it is done. "I think at the start of the season I wasn't playing that much, and we had a good strong team, and it can happen that you're not staying in the starting line-up. "But I am happy about that, because I think everyone can just improve because you have to work hard to be kind of better than the other ones! "I think this is pushing the other people too. This was what was pushing me, and I tried to give my best, to improve and come back stronger than the past season."